Adam and Eve sinned in Genesis 3. They ate the cumquat fruit that was forbidden and it says their eyes were opened, meaning they realized something - they were naked as the noonday sun. Oddly, nakedness had no meaning to them until they disobeyed God, who tempted them, even though he doesn't tempt mankind, until they sinned. Thus they frantically sewed hula skirts together with fiberglass rope and created the first Scottish kilts for men. When God came back to the garden, knowing everything, and yet not being able to find Adam and Eve, he cursed all he could find to curse and then made proper pantaloons for Adam, and a pastel blue, triple breasted, plain dress for Eve. Adam was also given a button-down, long-sleeved shirt with crisscrossed threads clasping the collar shut, in lieu of a button. For undergarments, Adam was allowed to wear none whereas fashioned for Eve was a burlap petticoat and large elastic granny undies. Adam was allowed to go barefoot but Eve wore wooden clod shoes with pointed toes. Then, the two were whisked out of the garden and made to live in misery until their death. Unfortunately for them, all humans were cursed with sin. Obviously, it had to be that way, being that any human being, when told NOT to touch something, doesn't even give that forbidden thing a second thought. Thus, Adam and Eve were exceptionally sinful and we had to bear the stupidity of the first humans. If only God had done a better job of creating the first humans. I know I would have slapped my rebellious wife if she had offered me the cumquat. Then, what would have happened? Only women would have been sinful? Or, God would have offed Eve (or allowed Adam to) and then created woman from a second rib, leaving men with two fewer ribs than women, rather than just one? So, man was all dirty and unrighteous and could do nothing to get all clean and righteous. Lo and behold, along comes this guy named Jesus, God's son according to a gospel or two and not according to other gospels. He dies on the cross to take away the sin of the world. Some say we have to believe in that, while others say it was completed for all, so just live in the moment (or was that a 50's rocker?). Still others claim that God only picks a few people that he likes and allows them to have a free pass to heaven while the others have to burn in hell for eternity. Whichever camp you pick, or better yet, if you're lucky enough to be born into the right camp, you come out on the other side of the sins forgiven at the cross part, smelling like a rose. You have no more sin! 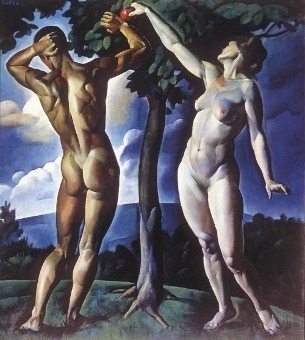 Adam and Eve sinned in the garden and had to wear clothes. Your sins are now forgiven - forever - which obviously means clothing is optional. No, not optional...wearing nothing is the sign of a righteous person! So take off your clothes and enjoy your righteousness.